Employers, universities and other educational institutions around the world recognise Cambridge English qualifications. These qualifications are valid for your lifetime and are internationally-recognised. Our Cambridge exam preparation courses will help you achieve real results. They are carefully designed to prepare you for the exam with the skills and knowledge for success. Improve your opportunities for future employment. Study at degree level an English-speaking university (CAE). Succeed in careers requiring a good level of English communication skills. Have a competitive advantage over other candidates in job applications. Obtain a qualification that will last forever. Working towards an exam helps you to structure your learning. Structure helps you to focus on all the areas you need to improve upon. Building competence across all areas of speaking, writing, listening and reading will help you gain the best grades you can. All of our exam students will work on vocabulary, grammar and pronunciation to improve their overall scores in speaking English. We know that our positive and inspiring surroundings can help you achieve your fullest potential. Our teachers guide you through the types of questions that are asked. You will learn a proper exam technique to help you stay calm during the exams. This certificate level is: B2 or Upper Intermediate. This Cambridge exam tests your range of spoken and written English. It tests your English language skills, your English vocabulary and your grammar. This exam is one of the most widely recognised in the world. With content and topics tailored to your needs, the test measures your ability and range of spoken and written English. Speakers at this level can express themselves clearly on a range of subjects. As an example; using English, you would be comfortable showing visitors around a building, and you would be able to give a detailed description of your surroundings. Many foundation and pathway university courses in the UK accept the Cambridge English First Certificate. This Cambridge exam tests the English skills needed for most professional and academic situations. It is similar to the FCE exam, but is for learners with a higher level of English. The CAE/C1 Advanced English exam is written at a level above the First Certificate. The exam is split into five parts, consisting of reading, writing, use of English, listening and speaking. Each section of the exam counts as 20% towards the final mark. The speaking part of the test is carried out with an examiner in an interview format, allowing you to create more natural conversation scenarios. 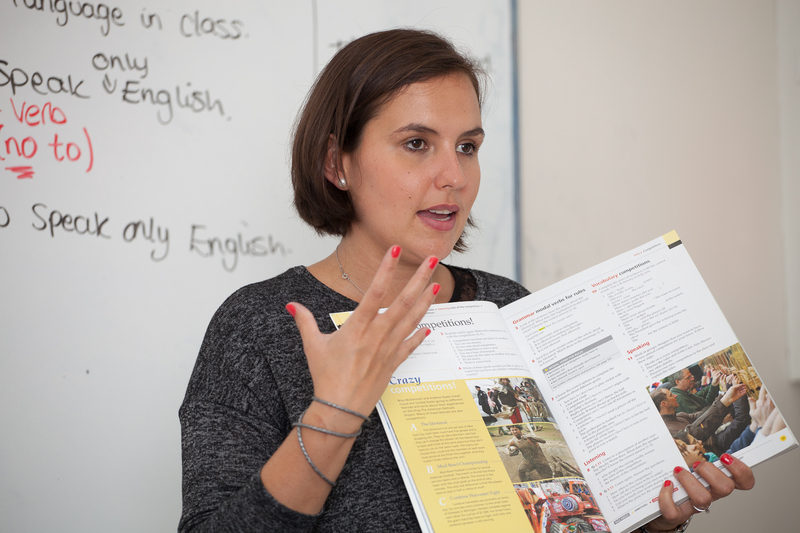 Do you want to see our amazing prices for these English courses in the UK? Get an instant quote for the course you need. Our English teachers prepare students so that they achieve the best possible grades. Your lesson time will help you gain all the knowledge you need to get the results you want. Our Cambridge English Exam preparation teachers know what is needed to get an excellent score in the Cambridge exams. Their good understanding of the Cambridge requirements will help your results. Of course, your reading, writing, speaking and listening skills should also improve significantly. We want your exam result to show your true potential. We will work on your vocabulary, grammar and pronunciation. Your English will also improve from being activated by communication with your classmates and people you meet in Brighton. Exam technique is an important part of your preparation. Your results will be significantly improved if you know the types of questions to expect. It is also a big advantage to know the types of answers the examiners want to see. Studying Cambridge exam practice papers will develop specific exam skills. Cambridge exam preparation courses build the knowledge and experience required for your success. Your teacher will monitor your progress, identify your strengths and weaknesses, and give you guidance to maximise your chances of success. We understand the importance of giving you encouragement, confidence and motivation, and this is at the heart of our approach. Castle School Tutorials are individual and personal. These opportunities for students and teachers to speak more directly are very helpful. They are an important part of the learning experience at Castle School. Students can work with their teacher. Together they can reflect on the progress of the student. They can make sure that their educational needs are being met in the classroom. Tutorials are also a chance for students to talk to their teacher. They can discuss any feelings they may have about their lessons and the school. We provide Castle School Tutorials because we know they are extremely beneficial. It is our mission to help students achieve their goals in the international community.